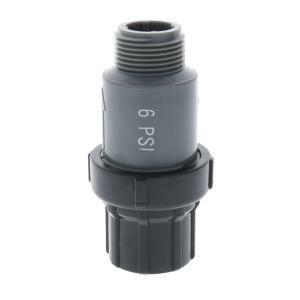 This extremely durable 6 PSI pressure regulator is equipped with a 3/4" FHT inlet x 3/4" MPT outlet. Always install pressure regulators downstream from all shut-off valves. Be sure to install pressure regulators in the proper direction. The arrow on the housing shows the direction of the flow and should always point downstream toward emitters.